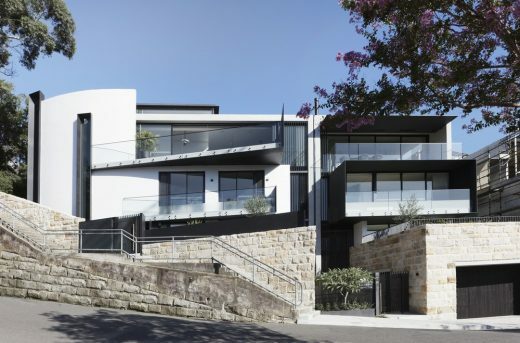 The brief for this project was to transform an existing weatherboard house in a suburban area of Sydney into a modern family home. 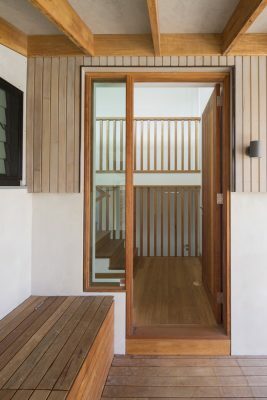 The existing two-storey house, sat on a sloping block and had a ground floor that did not connect to the rear garden and had insufficient head room to stand in. 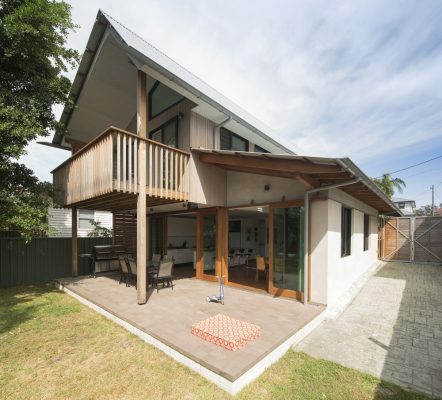 This house is an exemplary example of what we think should be ‘the norm’. 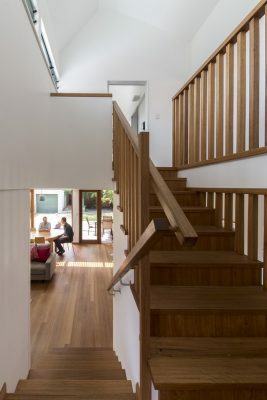 It is designed to be ‘appropriate’: the right size for its purpose, built as far as possible with sustainable materials, energy efficient, flexible in terms of space, and built for the long term. Above all, it is a house designed for a family. They have lots of stuff. They have swimming lessons, piano, tennis, soccer. Mum and Dad both work. There’s a lot going on. So the demands on this house, every day, are high. We strongly advocate to our clients that a key principle of sustainable design is size. A bigger house uses more resources to build but also to light, to heat, to clean and to maintain. So even on this site where space is available we have designed for compact and efficient living. This means every space has to work hard, be flexible and versatile and get it’s feeling of spaciousness from visual tricks, rather than actual bulk space. Here, we raised and rebuild the upper storey to increase the head height below and allow a good connection to the garden. This gave us the opportunity to provide ample northern light in to both levels of the house and natural cross ventilation throughout. The result also needed to be of a character that is appropriate with the scale of the surrounding buildings and deal sensitively with issues of privacy to and from the neighboring sites and the street. The old interwar period house was renovated and has become three bedrooms, a home office and 2 bathrooms. 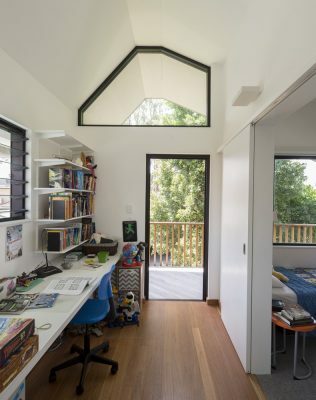 The first floor addition contains everything bedrooms and study spaces for the children. A new entry foyer (the bridge) connects the old and the new, and provides ample space for the dumping of school bags, tennis rackets etc. The new spaces have a highly controlled complexity. 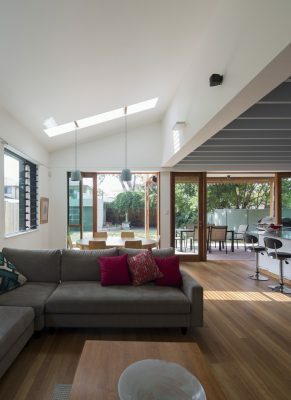 All spaces are interconnected but it’s not ‘open plan’ in the sense of many rear additions. Space is highly articulated and the relationships between them are sophisticated and specific. In this part of Sydney land value is high and many houses in the area have become bloated. 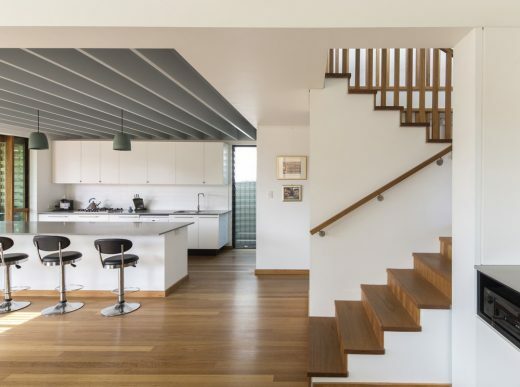 We were concerned from the start that the choices of the neighbors never detrimentally affected the lives of our clients, and so designed a house which grasped it’s north light from almost the centre of the site, rather than the northern boundary. On the exterior a high north facing clerestory style window appears continuous but actually imparts it’s light into four different spaces. Hot air is also vented out these windows from all levels of the addition. All of our projects are ‘sustainable’ architecture. Every project is designed with the following principles as integral to the process and the result. 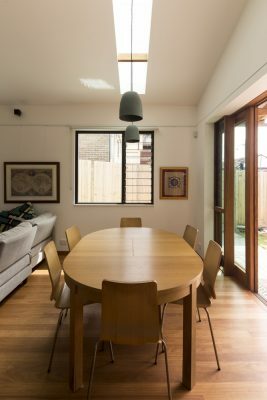 Passive: the majority of issues to do with energy use, amenity and comfort in houses, especially in Sydney can be solved by good design. We always design out the need for mechanical systems. We insulate, ventilate and control the sun for heat and light. Size: keep it small. Smaller buildings use fewer resources in construction and in the ongoing life of the building. Adaptive: most buildings, where structurally sound can be adapted to new purposes, so we always look to retain as much existing building as we can. Materials: keep it simple and recyclable. Use renewable timber instead of steel and avoid all kinds of composite materials where possible. Only use finishes where absolutely necessary for the longevity of the material. Choose materials for their ability to weather well and be stable in the long term. This house is an exemplary example of what should be normal. It is appropriate. That’s all. This house is well built, with thoughtful resource and material choices. It is planned to be flexible for use by people over time. It is not larger than is necessary. It is in every way an example of how it is possible to build and live with less impact on the environment. It is a ‘house for life’. All the products used in the building were chosen for their low embodied energy, low VOC’s and sustainable production methods. High quality, sustainable, low or no VOC’s, predominantly made in Australia. Rain water is harvested and used in the laundry, toilets and for the garden. 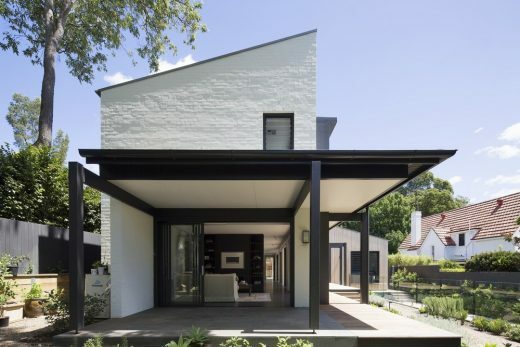 The house is passively heated and cooled and does not rely on any mechanical systems. 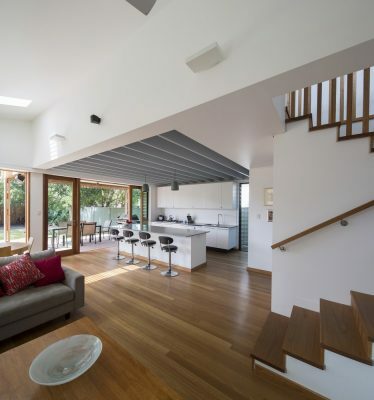 Cross ventilation and natural light are optimised and the house is heavily insulated.